Setting an intention at the beginning of your yoga practice is so simple and incredibly powerful. Take a few deep breaths, turn your attention inward and ask yourself what you need most in the moment. Maybe it’s to take care of yourself and appreciate your body, it could be to feel grateful or joyful or compassionate, perhaps it’s simply to rest or to energise. As you move through your practice let that quality or feeling inspire and guide you. You can even continue to return to your intention throughout your day and see how you can bring that same quality in to your life off of your yoga mat. Your yoga practice should NOT be a time when you bring more stress in to your body or put any more pressure on yourself to achieve or be better or try harder! It should ABSOLUTELY be a time of feeling good, allowing yourself to be just as you are, with a deep appreciation for yourself. Yes it’s great to challenge yourself, build strength and step outside your comfort zone from time to time BUT notice if what you’re doing feels energising, uplifting and courageous or if you’re trying to pull and strain your way in to a pose…holding your breath…frowning as your face turns beetroot red…teeth gritted and muscles screaming! Remember that your yoga practice should energise and relax you not leave you feeling depleted and frustrated. Cherish the movement between each yoga pose as much as the pose itself. It’s easy to rush from one pose to the next, always looking ahead, but instead try to enjoy the journey between poses and appreciate the moment. Breathe deeply as you move, and flow mindfully, deliberately and unhurriedly. Even if the style of yoga you practice doesn’t involve much movement there will still be important spaces between poses where you can cultivate calm and practice staying present. This includes the end of your practice too! Try not to jump up and run off after your class if you don’t need to. Pause and enjoy the benefits of your practice, smile at your fellow yogis, tell your teacher something you appreciated in the class or put away the yoga blocks of the person next to you. Your body moves continually as you breathe. Try it right now! Take a deep breath in through your nose and feel how your shoulders lift, your chest expands and if you’re really breathing deeply feel that expansion in your belly and back ribs too. Then witness all of that movement happen in reverse as you breathe out. You can use this subtle movement to find greater freedom in yoga poses where you feel stuck, rigid, uncomfortable or tense. 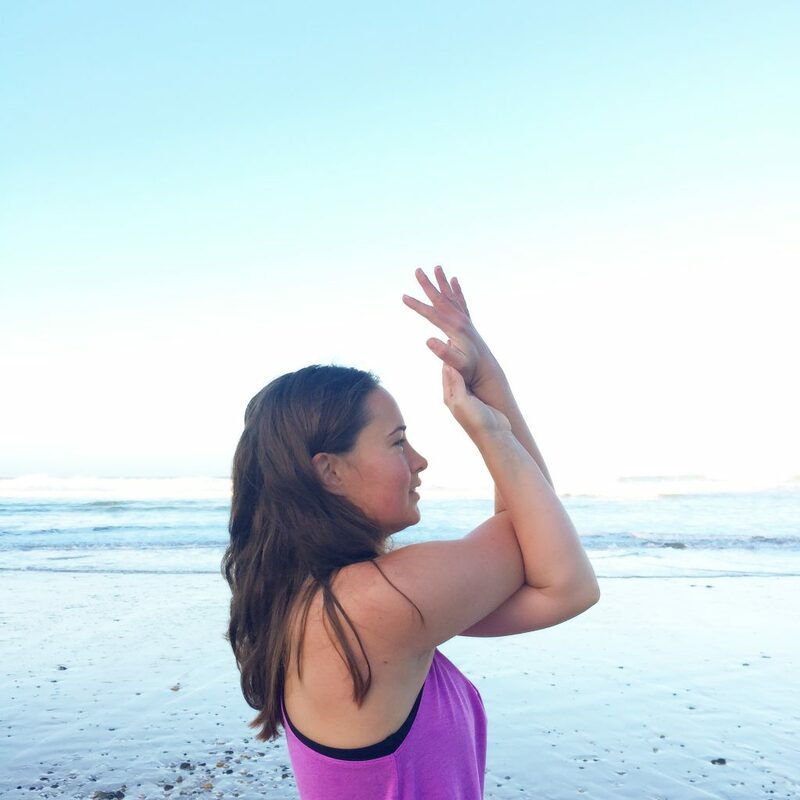 Focus on all of the expansion that occurs when you inhale and the softening and relaxation as you exhale and feel how even in what seems like the most static of poses you can find more space and ease. Just because you CAN do a yoga pose doesn’t mean you have to! 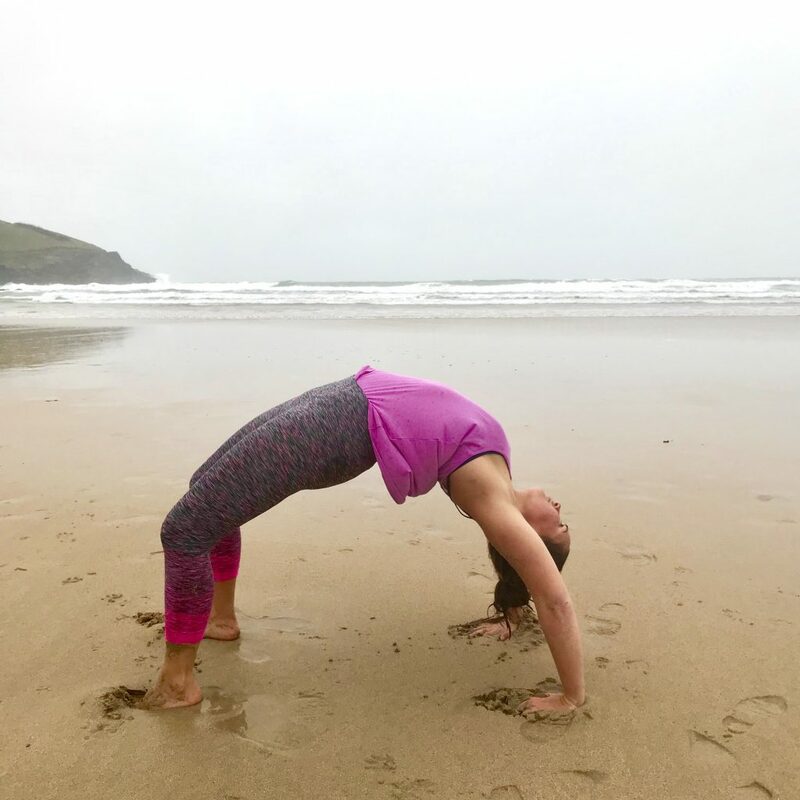 On a sunny summer’s afternoon during a beach yoga practice when I’m feeling full of energy wheel pose (pictured below) feels wonderful. On a cold winter morning when it’s still dark outside and my shoulders are aching from yesterday’s surf can I do even one wheel pose? Well maybe just BUT is it going to feel good? NOT AT ALL. Meet yourself where you are on your mat. If it doesn’t feel good TODAY don’t go there! You don’t have anything to prove. And please don’t feel like dropping in to childs pose during your yoga class is the ‘easy’ option. It could be the most ‘advanced’ option if you are really listening to your body and doing whats right for you. As a teacher I think it’s wonderful to see students taking restful options as it means they are truly listening in to what they need in the moment. Wow, so there’s a lot to take in here I know! More than anything remember to bring in so much compassion, curiosity and patience to your yoga practice.